Last weekend I went to the 35th annual OTAC (Occupational Therapy Association of California) conference in Sacramento and had an incredible time meeting other occupational therapists, while attending sessions. It was great getting an opportunity to be part of the conference because they offer so many resources that help further the profession. Not only did I get to meet many potential employers from different areas of OT from pediatrics to geriatrics, I got to meet other students that have the same aspirations that I have. One of the best times I had was being part of the student scavenger hunt where we got tour the city of Sacramento and find the historical values that the city has to offer. My team ended up winning the activity and got OTAC shirts and gift cards as prizes! My team consisted of 1st year students at USC so it was a great opportunity to meet them running around the city. Not did we get to learn the newest ideas in OT from the best and brightest, we took the opportunity to tour the city. 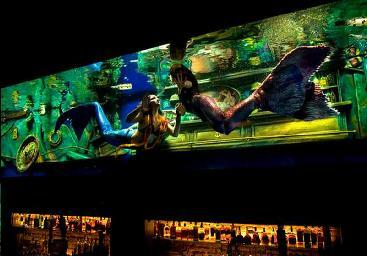 We found this really cool place called the Dive Bar and had drinks while gazing at the mermaids swimming in an aquarium above the bar. It was so awesome! Thank you OTAC and Sacramento for a great time! Halloween is fast approaching and some of us have decided that dressing up is still a good idea. Four of my friends and I are going to be the Teenage Mutant Ninja Turtles. I think this will be one of the coolest costumes I have gotten to wear yet! The costume will consist of various articles of green clothing, colored cloth masks and wrist and knee ties (appropriate colors for each turtle), a shell made out of spray painting a snow disc sled, and then of course the weapons appropriate to each character. In preparing our costumes, we have also begun doing some research on each of the turtles to make sure we are not just turtles by costume, but by attitude also. The other day when I was explaining to a friend all I had learned about Donatello and what the costume would look like, she said, “you are totally approaching this Halloween thing like you would researching for a role that a client might have!” At first I countered her claim but as we talked I realized that it was true. We were doing research for becoming the Teenage Mutant Ninja Turtles like we would any other role we might come across in OT. Even in this very remote activity from school, we couldn’t keep the stuff we’re learning out. So there you have it, OT is everywhere…unavoidable in even costume making. Happy Halloween everyone! In OT 550 “Foundations of Occupational Science” we had an assignment last week that was to attend a sporting event instead of going to class… pretty cool, right? The purpose of the assignment was to examine the components that comprise play for adults, such as intrinsic motivation, self-actualization, creativity, lack of seriousness, etc. and also to see how sporting events are representations of political, social, and religious rifts in society. Well, I decided to go to a sporting event I had never seen before: polo. The Vueve Clicquot Polo Classic takes place at Will Rogers State Park in Pacific Palisades. Ladies in broad rimmed hats scattered the lawn surrounding the field holding glasses of champagne in one hand and a golden Veuve Clicquot sun umbrella in the other. Men in suits and wearing Panama hats lounged in their lawns chairs. Needless to say, it is quite a classy affair. For only $15 you get a day full of entertainment, socializing, and lounging in the sun! In class the following week we discussed our experiences and related them to the themes in the readings. It was so interesting hearing about everyone’s experiences and trying to collaborate with the whole class to reach an agreement about what constitutes play. Some say we work to play, and some say we play to work because without play we would get burnt out. And then there are those that get paid to do something they truly love and never really “work” a day in their lives. Once I become an OT, that will be me! I’m looking forward to an event at USC tomorrow called Send Silence Packing. 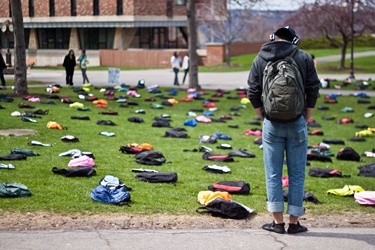 Sponsored by Active Minds, Inc., this event will include an exhibit of 1,100 backpacks on the lawn of Alumni Park, each one representing a college student who lost his or her life to suicide in the past year. The backpacks contain stories, photos, and other mementos from family members who have lost their loved ones to suicide. Mental health issues on campus can sometimes be difficult to talk about, so I think this will be a powerful way to raise awareness and promote dialogue. Best of luck to everybody volunteering at the event tomorrow. What do an occupational therapist and funeral counselor have in common? We are both paired up as related professions in order to speak to high school students for Career Day. It was great to meet so many high school students who are enthusiastic and curious about their future. This was a good opportunity to spread awareness of occupational therapy to the youth so they can have an idea of the wonderful profession of occupational therapy. At first I thought the students would ask questions relating to compensation, but I was totally wrong. Most questions were addressed to the lifestyle of an OT and the satisfaction of working with people. The students and even the teacher were engaged and very interested in learning about this profession. It is always nice to see the expression on people’s faces when they first learn about what occupational therapy is and how it can impact a person’s life and well-being. I also learned much about the skills needed to be a funeral counselor. They work with people during times of sadness and sensitivity. Sometimes, therapists have to do the same, so it was nice to find a commonality between our professions. All in all, it was a great learning experience for all of us.